10-14-14 Update: In the past few days, Committee to Revitalize our School, Yes on Measure I, has reported another $11,000 in campaign contributions from three trade unions, none of whom are based in Alameda, but whom presumably expect to profit at Alameda taxpayer’s expense should Measure I pass. The unions are based in Dublin, Oakland and San Ramon, California. Contributions from natural Alameda constituents are down to around 11% of the total contributions to the campaign. The City Clerk for the City of Alameda confirmed today (Oct. 13th) that the Yes on Measure I committee, Committee to Revitalize our School [sic] filed their interim campaign finance statements at City Hall only today, October 13th, seven days past the October 6th filing deadline. Presumably they did this to file after absentee ballots began arriving over the weekend, to hide the fact that of $8,500 in campaign contributions received between July 1st and September 30th, not one penny came from Alameda sources. According to the filing, the committee has raised $16,614.14 in total this year, but no supporting filings for that additional money are available on the City of Alameda’s website. Presumably these firms expect they will profit – at Alameda taxpayer’s expense – from Measure I passing and $180 million in bonds being issued. Certainly Quattrocchi Kwok Architects has already been receiving payments from the school district for architectural work. Who’s Paying for the Slick Yes on Measure I Mailers? Who’s paying for the slick Yes on I mailers that Alameda residents received this week? Wide distribution of these large format, two-sided, color glossy mailers must have cost tens of thousands of dollars to design, print and mail. Who’s paying for them? The Yes on I committee hasn’t filed their first pre-election campaign disclosure statements, even though the timing of these mailers suggests they have surely raised tens of thousands of dollars by now. In all probability, it is the bond underwriters – the companies that will stand to profit from issuing $180 million in bonds if Measure I passes – are also underwriting the Yes on Measure I campaign. We saw the same thing in 2004 with Measure C, when the bond underwriters UBS Securities and Piper Jaffray each contributed tens of thousands of dollars to the pro-Measure C campaign. Nonetheless, it won’t change anything. Measure I does not commit in advance how the money is going to be spent – read the measure! It doesn’t say which schools will get how much money for which repairs. Measure I gives future school boards a free pass on how to spend your tax dollars! The Alameda League of Women Voters is a dishonest organization. They pretend to be non-political, and provide un-biased information, but the reality is that the board is stuffed with City Hall and Alameda Unified School District cronies who rubber-stamp their friends’ initiatives. Take Measure I – the League said it evaluated input from both sides of Measure I, including opponents, but made no request for a presentation, presence or information from Save Our City! Alameda, the chief opponent on record in the voter guide. They aren’t saying who from the opponent side they spoke with, but it wasn’t us. Next, they’ve made an evaluation on Measure I and taken a board vote before holding their forum on October 2nd – so even through they pretend to be democratic and un-biased, by the time unaware voters turn up for the forum next week, thinking they are getting both sides of the story, the Alameda LWV has already decided, and this will undoubtedly bias their presentation, and the questions they accept from the audience. Don’t trust the Alameda League of Women Voters. Vote No on I – No more student debt. Here’s why you can’t afford Measure I – your taxes keep going up, your utility bills, groceries, gas prices too. Yet your income is stagnating, or worse, declining. Late last month, Bloomberg Businessweek covered a report by the Economic Policy Institute that confirms what you already know – you’re pedaling faster and faster, but not getting anywhere. Real hourly wages declined for almost every segment of the U.S. workforce in the first half of 2014, according to a briefing paper released Wednesday morning by the Economic Policy Institute, a liberal think tank. “The last year has been a poor one for American workers’ wages,” economist Elise Gould, who directs EPI’s health policy research, writes in the report. As this chart shows, unless you are at the very top of the pile in terms of income, your real wages – ‘real’ means as measured after inflation – have stayed flat or even declined since 2010. 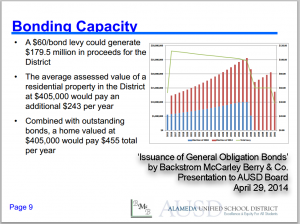 And yet, the school district wants to double what you pay now for school bonds, as shown in the chart below, provided by the bond consultant to the school district. And that’s on top of the parcel tax! Presentation by bond consultants show that under Measure I, tax bond payments would effectively double, and this is in addition to the parcel tax from 2011. You can’t afford Measure I – your real income is declining, and yet the school district keeps coming back for more and more. How Much Will I Pay Under Measure I? The complicated nature of the calculation of taxes for these bond measures doesn’t help. Measure I will levy a tax equal to $60 per $100,000 of assessed valuation of your property. So, for every $100,000 of value assessed on your property (look up your tax bill), you will pay $60. Divide the assessed value of your home by $100,000 and multiple by $60. Note that the previous tax bonds from Measure C, in 2004, are still being paid back, for decades to come, and that tax is still on your bill. That’s about $58 per $100,000 in assessed value, so Measure I will effectively double those taxes. Using this table, below, you can roughly estimate your total tax bond burden – excluding the parcel tax – should Measure I pass. Determine the assessed value of your home, and find the column with the amount closest to that value. Vote No on I – No more student debt! Seeing as how the Alameda League of Women Voters chickened out on offering a Measure I specific debate or forum, we have launched a series of short (20 minute) livestream broadcasts that explain how Measure I works, and why you should vote No on Measure I. Here is a recording of the Sept. 12th livestream broadcast. Measure I will increase ‘student debt’ on Alameda families, for as much as 25 years, with no detailed spending plan. Vote No on I. The Alameda League of Women Voters has chickened out on hosting any kind of debate or public forum on Measure I. Presumably because they know the ballot measure is distasteful, and opponents will tear it apart. The local league is just an extension of Alameda City Hall and the school district, so they don’t want to give opponents a forum to explain just how bad Measure I really is. Instead of a debate, or even the traditional nicey-nice “forum” specific to Measure I that the local league is known for, they have announced a broad ‘pros and cons’ forum in early October to discuss all measures – state and local – on the ballot this fall. Likewise, the City of Alameda Democratic Club – also an extension of City Hall – foreclosed on any opportunity to host a Measure I specific forum, presumably for the same reasons. Vote No on Measure I – tell AUSD to go back to the drawing board. Labor day is the traditional official start of the election season, and sure enough, in Alameda, we saw the obligatory law signs sprouting that weekend. But for the Alameda Unified School District, the campaign for Measure I (Vote No! ), on the ballot this November, started back in 2012, when the ugly brown fence went up around the historic Alameda High School building. Almost immediately after the Measure A parcel tax passed in 2011, the district started spending on the administration. Of course, parcel tax money was not to be used on administrators, but what it did was free up a bunch of general fund dollars for the administration to play with. Right away, the superintendent began hiring administrative assistants, and plotting the move of the administration’s offices from the historic Alameda High School to new, upgraded digs. No space at the former Naval Air Station Alameda – leased from the City of Alameda on favorable terms – would do. Instead, AUSD administrators had to have a fancy new office in Marina Village, leased from a property owner that contributed funds to the pro-parcel tax campaign. The lease included options to purchase, to boot; the district wanted out of the historic high school building for good. This was the beginning of the campaign for a $180 million tax bond measure (Measure I) that has no detailed spending plan, and nothing that binds the school district spending tax payer money in accordance with what voters think they are voting on. Measure I is completely irresponsible – it provides no detailed spending plan, and does not commit to voters in advance exactly how the money will be used. The Measure I implementation plan? It’s a hoax – it’s not part of the ballot measure, read it carefully. Fixing the historic Alameda High School building? Measure I does not commit to doing that. The so-called ‘Measure I implementation plan’ is not part of the ballot measure. It was only a massive public outcry by teachers and residents that the district didn’t go forward and spend millions to buy their lush new office building. AS a community, we can’t afford to protest and demonstrate with each and every bad spending decision that would surely follow the passage of this ‘superbond’ tax measure. The only way to ensure that AUSD uses your tax dollars wisely is to Vote No on Measure I, and tell the district to go back to the drawing board. So now, Alameda Unified School District officials have taken to referring to a “Measure I Implementation Plan,” except, there is no such plan. As covered previously, the implementation plan that Measure I proponents talk about is a presentation that the school board reviewed in June, 2014, but it is not part of the Measure I ballot measure language, and in no way binds school district officials as to how they spend any bond proceeds. Read the Measure I ballot measure – there is no talk about an implementation plan. The latest hocus-pocus from school district officials comes in an agenda item for a solar panel master an upcoming school board meeting. If you have read the ballot measure, you’ll note that it talks about using Measure I bond proceeds to pay for solar panels. But the school district has no detailed spending plan for this! And even if they do this, there is nothing binding in Measure I that commits them to spending money in accordance with the program. 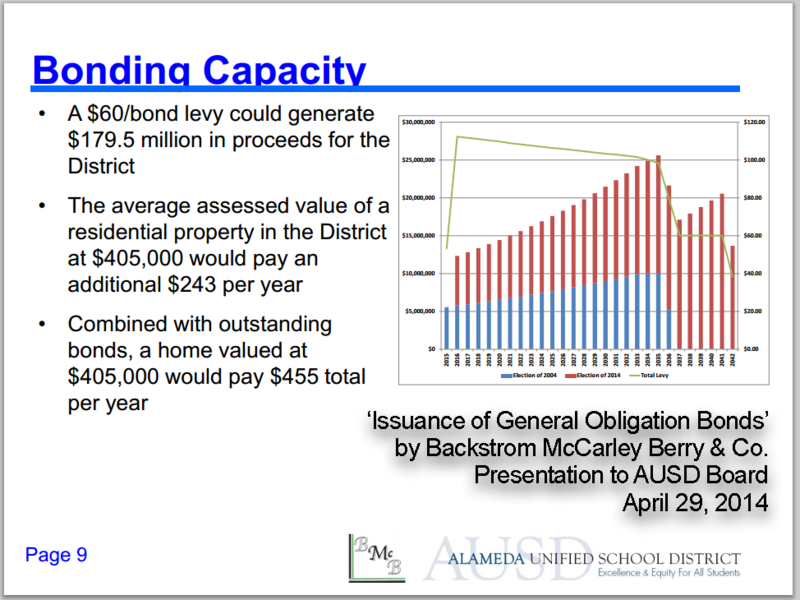 “Give me your money now, we’ll figure out how we want to spend it later!” – that’s what the school district is telling Alameda voters.